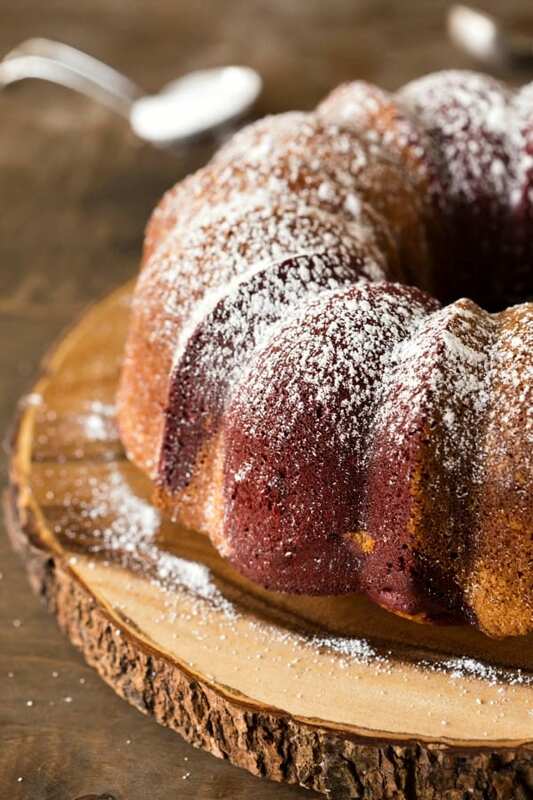 Moist Red Velvet Marble Cake recipe makes a marble cake that looks as good as it tastes. 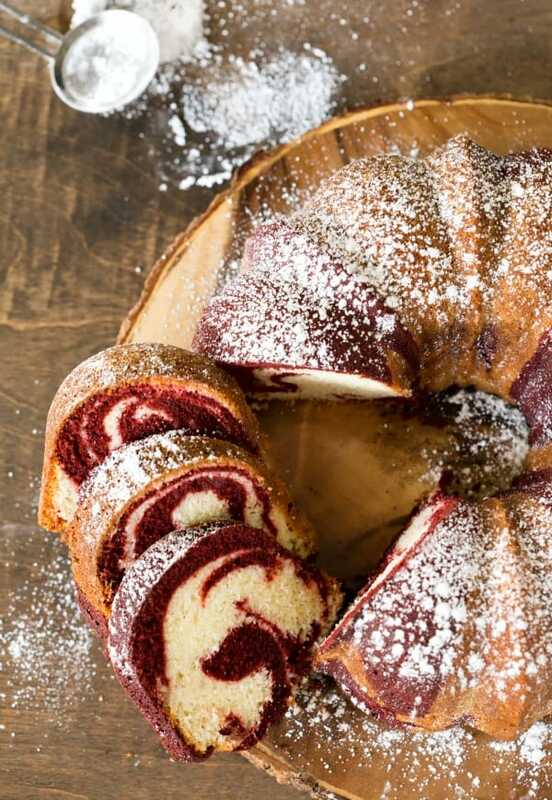 Plus, get tips for making the perfect marble cake swirls. Once in a while, I like to grab one of my recipes and give it some new life. And this Red Velvet Marble Cake is definitely worth some new love! Red velvet is one of those cakes that I have trouble passing up. This cake, though, is a bit different than the normal red velvet layer cake. It’s a red velvet cake meets a pound cake, and the resulting marble cake is rich and delicious! The marbling technique for making the swirls is easy, and it gives you a great effect without the risk of blending the batters together. It’s a perfect Valentine’s Day or Christmas dessert that would be just as at home any other time of the year. A marble cake is a cake that has a light and a dark batter swirled together. Chocolate and vanilla are the most common pairing, but this cake swirls red velvet and vanilla cake batters together. Traditionally, cake batters are swirled together with a knife. The trouble with that method is that it’s easy to over-swirl and end up with muddied swirls. With this method, the different batters are layered on top of each other. This helps to preserve each batter and gives the cake its nicely defined swirls. This cake will keep for about 3-4 days. I cover it and keep it at room temperature. Red velvet marble cake video! 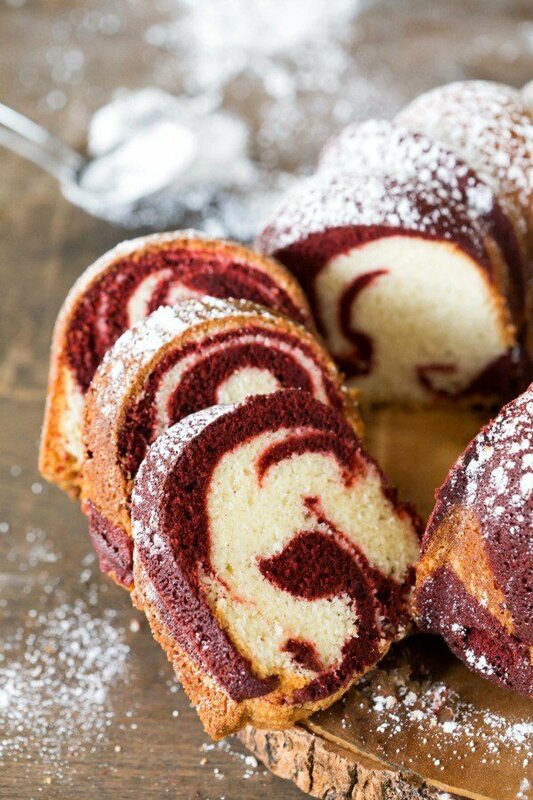 If you’ve tried this red velvet marble cake recipe, don’t forget to rate the recipe and leave me a comment below. I love to hear from people who’ve made my recipes! You can SUBSCRIBE to receive my latest recipe newsletters or FOLLOW ME on FACEBOOK, INSTAGRAM and PINTEREST for even more delicious food. 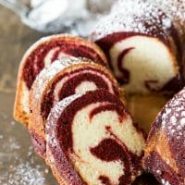 Easy recipe to make perfectly swirled red velvet marble cake. Preheat oven to 350 F. Grease and flour a 10-15-cup bundt pan. In a medium bowl, whisk together cake flour, baking powder, and salt. In the bowl of a stand mixer fitted with a paddle attachment, beat together butter, sugar, and yogurt until well-combined. Stir in vanilla until combined. Add eggs one at time, mixing well after each addition. On low, stir in flour mixture until just incorporated. Stir in milk until combined. In a separate large bowl, stir together 2 ½ cups of the batter, cocoa powder, milk, and red food coloring until well-combined. Using a 1/4-cup measuring cup, drop two scoops of plain batter into prepared bundt pan. Drop one scoop of red velvet swirl batter on top of plain batter. Continue to alternate between plain and red velvet swirl batters until both batters are gone. Bake for 50-60 minutes, or until a wooden toothpick inserted into the center comes out clean. Cool cake in the pan on a wire rack for 15 minutes. Invert the cake onto wire rack, and cool completely. *I suggest using unsweetened cocoa powder rather than Dutch-processed because it lets more of the red color come through on the swirl. **Disclaimer: I'm not a nutritionist. Nutrition facts are estimates. Congrats on making your first bundt cake! =) I’m glad that the recipe worked well for you and that you liked the cake. Thank you for taking the time to comment! Great recipe, I made this cake a couple of Christmases ago it was a hit, I’ll be making it for Valentine’s day. Thank you! I’m glad you liked the cake. =) Enjoy! Hi do you use unsalted butter since your putting salt in also. Hi! No, I use salted butter. Hope that helps! Just got done making it for Thanksgiving. Looks good. I can’t wait to try it. Thank you! I hope you enjoy the cake! Happy Thanksgiving! Thank you so much! I’m so glad that you like the cake. =) Thank you for taking the time to come back and comment! Fantastic recipe! I made this for a lady’s luncheon. The cake was perfect, and everyone loved it. Is self-raising flour and cake flour the same thing? Unfortunately, no. Self-rising flour also has baking powder and salt added in. Cake flour is a lower protein flour that creates a more tender baked good.